The government's cuts to federal science budgets and its changes to policy are damaging scientists' ability to serve and protect the public, according to a new survey. The survey was commissioned by the union representing federal scientists. - 91 per cent think cuts to federal science budgets will have a detrimental impact on the federal government's ability to serve the public and 51 per cent think the impact will be "very detrimental." - 69 per cent of 690 respondents at Environment Canada think Canada is doing a worse job of environmental protection than five years ago. - 86 per cent of 343 respondents from the Fisheries and Oceans Canada think recent changes to the Fisheries Act will hamper Canada's ability to protect fish and fish habitat. - 80 per cent of 268 respondents from the National Research Council think Canada has done a worse job over the past five years of advancing our international standing in technology and innovation. The government 'refocused' the agency to service business in 2012. As of 2:30 p.m. Thursday, Greg Rickford, minister of state for science and technology, had not responded to a request to comment on the survey. The union sent surveys to over 15,000 of its members, who work for the government as scientists, researchers and engineers. Of those, 4,069 or 26 per cent responded between June 5 and 19, 2013. PIPSC says the results are considered accurate within plus or minus 1.6 percentage points, 19 times out of 20. CBC's the fifth estate recently reported that over the past five years, the federal government has dismissed more than 2,000 scientists and drastically cut or shut down hundreds of federal programs and research facilities, including programs that monitored smoke stack emissions, food inspections, oil spills, water quality and climate change. PIPSC noted that so far, the government has cut $758 million of the $2.6 billion slated to be cut from 10 federal science-based department and agencies between the 2012/13 fiscal year and the 2015/15 fiscal year ending in April. Peter Bleyer, the union's head of policy and communications, said his goal was to learn from the scientists how they were experiencing the cuts and whether the cuts were really "back office" cuts as the federal government has suggested. What the survey found, he said, is "there has been a huge impact already, and this incredible fear over what's coming into the future and that these cuts will put Canadians' health safety and environment at risk." He added, "You have to use a very twisted logic to try and define these cuts as being back office cuts when you hear about what is actually being lost in terms of science capacity and direct impact that will have on Canadians." Bleyer acknowledged that it was natural for scientists to feel cuts to their own department were having an impact on their work. He said that is one reason PIPSC also wanted to get a sense of whether the government cuts and shift in priorities was aligned with the perspective of Canadians, so it commissioned a second poll from Environics. That one surveyed 1,003 Canadians last November on their attitudes toward government scientists, and the results are considered accurate plus or minutes 3.1 percentage points, 19 times out of 20. - 69 per cent of Canadians think cuts to federal science actitivites will have a negative impact on the government's ability to serve the interests of Canadians. - 73 per cent of respondents, including 67 per cent of Conservative Party supporters, think the top priority for the government science should be protecting public health, safety and the environment. Only 10 per cent though the top priority should be business innovation and resource development, and 14 per cent thought both priorities should be equal. Bleyer acknowledged that a lot of the "cuts" are, in fact, a reprioritization of government science, and that some areas such as resource development are getting more money from the government than before. 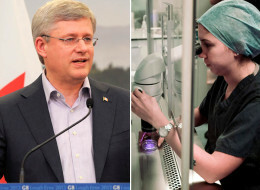 "The problem is," he said, "they're out of sync with the priorities of Canadians." Among the other findings of the survey of federal scientists was that 63 per cent are somewhat or very dissatisfied with the use of scientific evidence in policy development by the current government. In Fisheries, Natural Resources, and Agricultural and Agri-Food Canada, more than 75 per cent were dissatisfied. However, on the upside, 41 per cent of Health Canada scientists were very or somewhat satisfied – almost double the 24 per cent of federal scientists overall. - 57 per cent of respondents disagree that the leaders of their department or agency are making the right decisions for their organization. - A majority of scientists are very concerned about their ability to collaborate with international colleagues (73 per cent) and academia (69 per cent), due to new policies on intellectual property and increased permissions required to publish their scientific results. - A third are dissatisfied with their jobs, including 52 per cent of respondents at the National Research Council and 40 per cent at the Department of Defence. Seventy-three per cent of those who say there are dissatisfied are also considering retirement or leaving. - 53 per cent would not recommend a job at their department to a young scientist.